In compliance with various test requirements, this data logger is capable of performing high-speed simultaneous voltage and temperature measurements Easy-to-use upright high-speed isolated 8-channel multifunction logger An easy-to-use upright device enabling isolated 8-channel multifunction input, the GL900 is capable of performing high-speed simultaneous measurements of voltage, temperature, and various other phenomena. Setting example 4 To perform measurements for a period of one hour, every four hours, daily With the timer set to daily cycle status, data is captured repeatedly for one hour every four hours. High-voltage measurement capability The wide 500 V range enables 100 to 240 VAC power supply voltage waveform measurements. 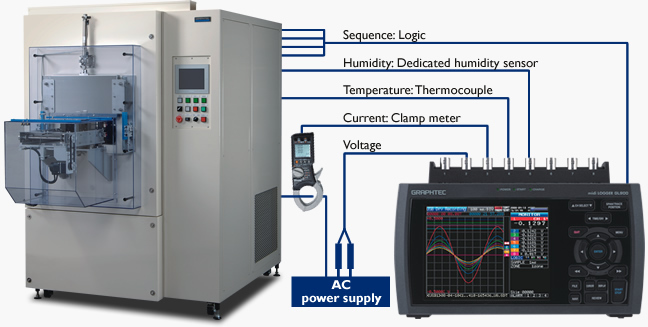 Using logic input and a clamp meter simultaneously allows measurement of a device's power supply voltage and current concurrently with sequential control of various points. Built-in, large-format 5.7-inch color LCD for easy-to-read waveforms The bright, easy-to-read large-format 5.7-inch color TFT LCD provides vivid, easy-to-read waveform displays. Cursor keys enable fast, easy control and setup. The waveform display can be scrolled at high-speed - 10 ms/DIV. 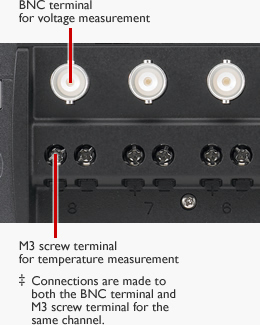 The Free Running display lets users check input signal waveforms even before measurements begin. Since waveforms are displayed on each setup screen, users can make settings while viewing the waveforms. Easy PC measurement via USB; remote monitoring via Ethernet web server and FTP functions The USB and Ethernet connections enable transfer of captured data to your PC and setup and control of the GL900 from a PC, even without the PC software provided standard with the GL900. Web server/FTP server functions Waveform display and GL900 setup operations can be performed via a web browser (e.g., Internet Explorer). In addition, data files captured to the GL900's internal memory or to a USB memory stick can be transferred or deleted from the PC. USB drive mode When your GL900 is connected to your PC via the USB interface, the GL900 can be operated in USB mode to enable fast, easy data transfers from internal memory to the PC. NTP client function Simply connect the GL900 to an NTP server via an Ethernet connection to synchronize GL900 time with NTP server time at periodic intervals Dedicated software for real-time data capture Three measurement screens are provided to allow selection of the screen that best suits measurement needs.